Every Civil War reproduction collection needs at least one printed plaid. Plaids can be woven, that is the warps and wefts are varicolored and produce square checks and plaids. 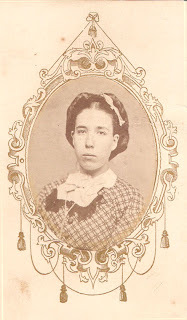 Plaids can also be printed onto plain cotton, a style quite popular in the mid 19th century. 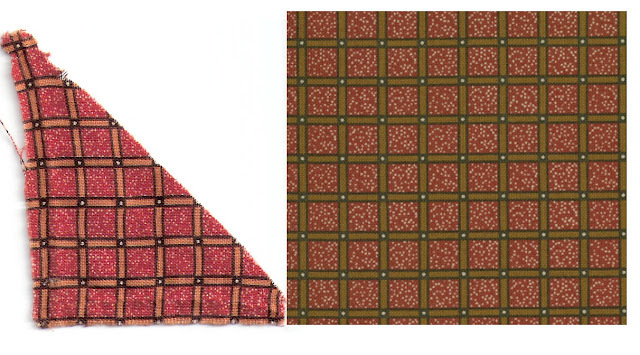 Below is one I called Sorghum Taffy from my Moda collection Civil War Homefront. 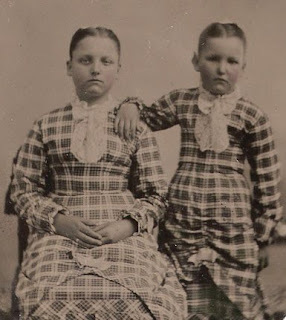 Tintype of sisters in matching dresses of probable printed plaid. The narrow silhouette indicates fashion of about 1870. 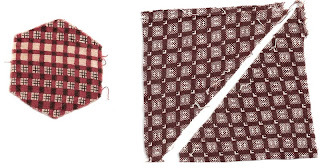 Left: a mid-century printed plaid; right: later in the 19th century. Printed plaids, although more expensive to produce, offer an advantage over woven plaids. They can be printed on the diagonal, a style impossible with varicolored warps and wefts. Woven plaids are hard to date. 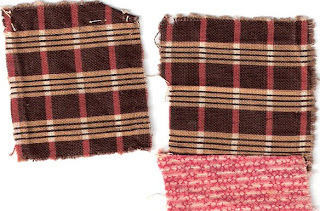 This 150-year-old plaid could have been bought at a fabric store last week. Sometimes the only way to tell a printed plaid from a woven plaid is by examining the frayed edge of a swatch to see if the warps and wefts are dyed in the yarn or printed later. In this case it's hard to tell because the printed dye colored the edge yarns so well. While examining it with a magnifying glass I realized I could turn it over. A woven plaid would be identical on both sides. This is not. As Homer Simpson would say: "Doh!" 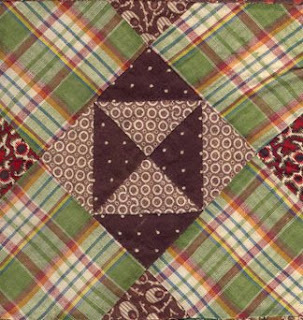 Of course, examining the reverse is not possible when identifying fabric in a quilt. I need to learn more about fabrics. I got a book from our library with quilts and textiles of Rhode Island and she mentions your name a few times. Thanks Barbara for sharing this info. There is a place in my heart for printed plaids! Like to use them often.